this is good timing (pun intended). i need to upgrade my wrist watch situation. i love my collection of timex watches, but i need something a little nicer for more formal events. enter the new j. crew collaboration with mougin & piquard. ernest mougin & paul piquard were two french ex-pats that moved to switzerland in the 1920’s and started a watch company with the goal to bring a parisian sensibility to swiss watchmaking. the company changed hands in the 1960’s and went out of business several years later. j. crew has teamed up with the good people at tourneau to recreate two mougin & piquard timepieces based on sketches discovered in their archives. they look great and retail for $425. i’m definitely adding one of these fine watches to my christmas list. 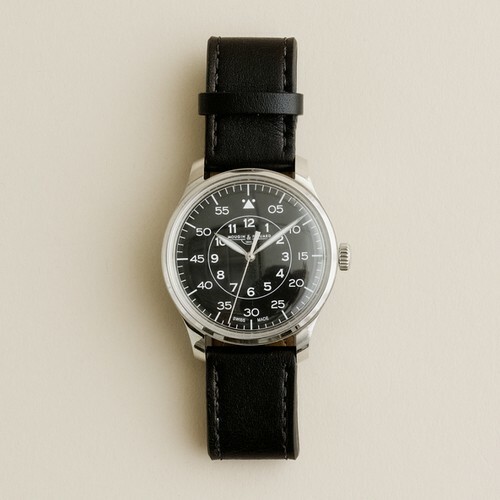 In my opinion, the price is far too steep for what is essentially a Flieger (Uhr B) with a quartz movement. 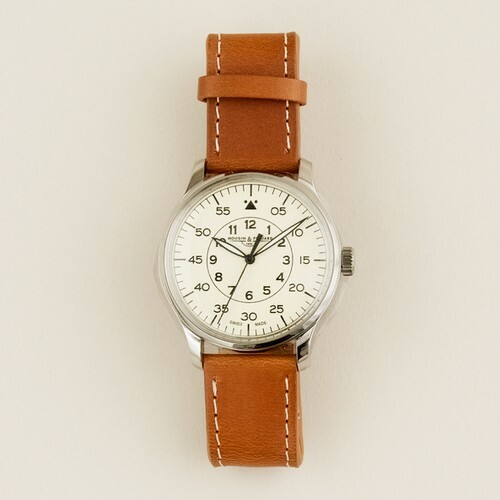 You can likely find a used Stowa or Laco flieger with an automatic movement for that price, or a brand-new Laco with a reliable Miyota automatic movement.